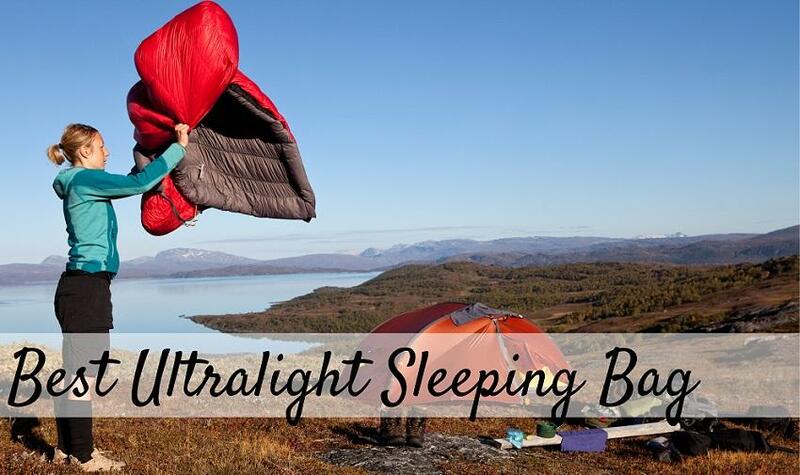 What is an Ultralight Sleeping Bag? Ultralight sleeping bags, or backpacking bags, are known and desired for their convenience. When you are going on a camping expedition with only the supplies you can carry, every piece of gear you bring needs to be as light and easy to transport as possible. Most often, ultralight sleeping bags are known for their ability to compress down to an unbelievably small size and the fact that they can weigh less than two pounds. Although many people look for a sleeping bag that will allow them to enjoy a comfortable night sleep, an ultralight sleeping bag’s purpose has more to do with saving space and energy, so it doesn’t offer the extra padding you may find in heavier sleeping bags. Almost all ultralight sleeping bags come with a specialized compression sack that squeezes the sleeping bag into a small, packable, light unit. But even though you may sacrifice some comfort for this convenience, ultralight sleeping bags can still keep you dry and warm in extremely cold weather conditions. Fill Material: Sleeping bags typically have one of two types of insulation materials: synthetic and down. Most serious campers and backpackers would recommend down because it is a natural material that is inherently light and easily compressible, so it automatically meets the most important requirements for an ultralight sleeping bag. Even though down-insulated sleeping bags are usually the pro’s choice, they are oftentimes the more expensive option. But, they will be a higher-quality, more-durable sleeping bag. Synthetic-insulated sleeping bags are more common among casual campers and families. These sleeping bags are still easily compressible, and very light depending on the specific material used, plus they are reasonably durable. Synthetic insulation is usually made of polyester, nylon, or cotton and it is dries much more quickly than down insulation does. Size & Weight: A sleeping bag is one of the three largest items you will carry on a camping trip and although all ultralight sleeping bags are compact and lightweight, you will still find some variations. Depending on the trip you are taking, you may want the lightest and smallest possible, or just one that is smaller than a regular sleeping bag. Ultralight sleeping bags can compress down into an 8 to 12-inch tall canister-shaped sack and weigh between 1.5 and 5 pounds. Be sure to consider the pack that your sleeping bag will be going in or attaching to, as well as the other items that will be going into or attaching to the pack. This will allow you to determine how much weight you are willing to add to your load, and where you can fit it. Fortunately, most compression sacks are adjustable and have pull cords that can change the size of your packed sleeping bag. Sleeping Bag Design: Most sleeping bags fit into one of four different design types: rectangular, barrel shaped, mummy, and double wide. In general, the rectangular shape is meant to be more spacious and comfortable, and it is easily turned into a double bed when zippered to another rectangular-shaped sleeping bag. A barrel-shaped sleeping bag is shaped like a V: wider in the shoulders and narrower in the feet. This eliminates some material and makes it more compressible. The mummy design is narrow and snug to the body throughout; it uses minimal material in order to conserve space and weight. And of course, the double-wide bag is twice the width of a rectangular sleeping bag and is meant to sleep two people. Deciding on the type of sleeping bag you wish to purchase is determined by your needs and preferences. You may opt for a sleeping bag with less material that is smaller and lighter, or you may let the shape and size of your body decide what will fit best for you. Weather Conditions: One of the most obvious factors to consider when planning a trip in the outdoors is weather. Consider both the temperature and types of precipitation you may experience on your camping expedition. Each sleeping bag has a temperature rating, which is the lowest temperature at which the sleeping bag will keep you warm. Generally, the temperature rating is set with the assumption that the sleeper will be wearing at least one layer of clothing. However, level of warmth is often a matter of perception that varies from person to person, so, as a precaution, be sure to buy a sleeping bag that is rated for temperatures lower than what you expect to encounter. It is equally important to consider the precipitation you may encounter on your trip. Most sleeping bags and their compression sacks are already water resistant or water proof when you purchase them, but if not, consider treating them with a water-resistant substance or purchasing an additional water-proof shell. What Are the Top Six Ultralight Sleeping Bags? Here is a summary of the top six ultralight sleeping bags, each offering a unique combination of desirable features. Each product is highly rated, and sleep tested. This four-season sleeping bag is lightweight, portable, and waterproof. It is barrel shaped, meaning it is wide in the shoulders and narrow at the legs. The sleeping bag is available in blue and red, and it is built for comfort. It is made with a polyester lining and exterior shell for durability. 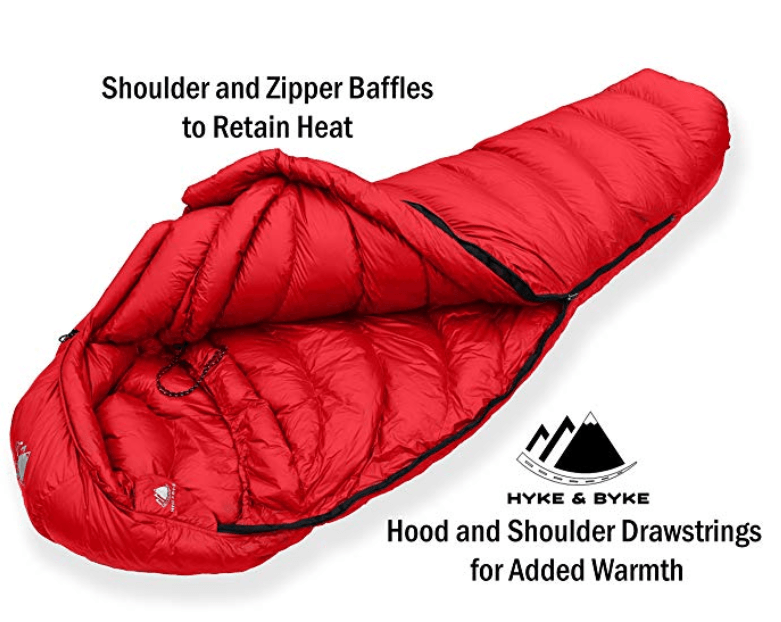 Even though this is an ultralight sleeping bag, it has a 20-degree Fahrenheit temperature rating and features a double-filled, quilted design. It is machine washable, and easy to transport with a compression carry bag. Abco Tech offers a 100% money back guarantee with your purchase of this sleeping bag. This sleeping bag offers a variety of features and options. It is available in green/grey and red/grey in both adult and child sizes. The Tracker is a mummy-style sleeping bag, meaning that it provides a snug fit around your whole body and a hood to keep your head and neck warm. Plus, it offers a zipper tube to prevent drafts and extra insulation around your feet for ultimate warmth and comfort. The sleeping bag is constructed with a brushed micro polyester liner, water resistant diamond ripstop shell, and microfiber PolarLite insulation for comfort as well as compressibility. 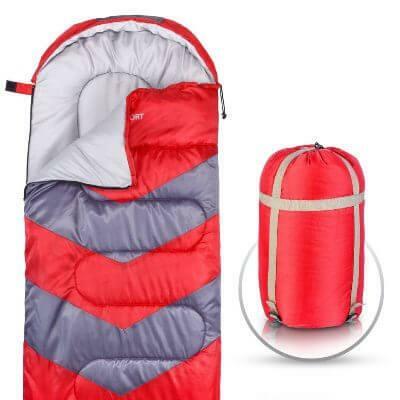 This sleeping bag is easy to pack into the compression sack, even without rolling. Additionally, it is rated for as low as 5-degree Fahrenheit temperatures. A limited lifetime warranty comes with the purchase of this sleeping bag. This sleeping bag is made with several high-quality materials; the shell and liner are both constructed with 350T polyester with a waterproof coating on the shell. It is insulated with 200G/m2 Hollow Fiber for increased warmth. Additionally, it has an upgraded, double-slider zipper that prevents snags. This mummy-style bag, which means it offers a snug, warm fit while sleeping and makes it lightweight, is rated for temperatures as low as 35-degrees Fahrenheit. There are also Wind Pads that surround the hood to prevent heat from leaving. It comes with a compression sack for easy packing and transport. Finally, Winner Outfitters offers a 30-day return or refund guarantee and a 365-day warranty, as well as discounts when you purchase 2 or more of their select outdoor products together. 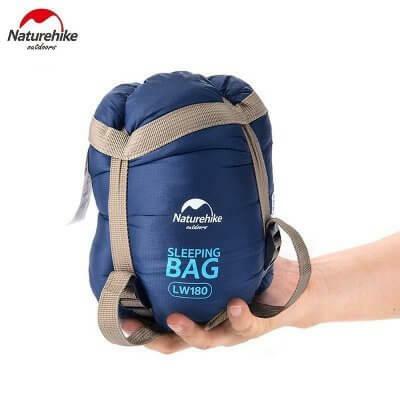 The Naturehike three-season sleeping bag has a traditional, rectangular design and is rated for temperatures as low as 60 degrees. It measures 190cm x 75cm when unfolded and comes in three colors: army green, dark blue, and sky blue. This sleeping bag is constructed with a waterproof, polyester cover, a cotton liner, and cotton insulation. 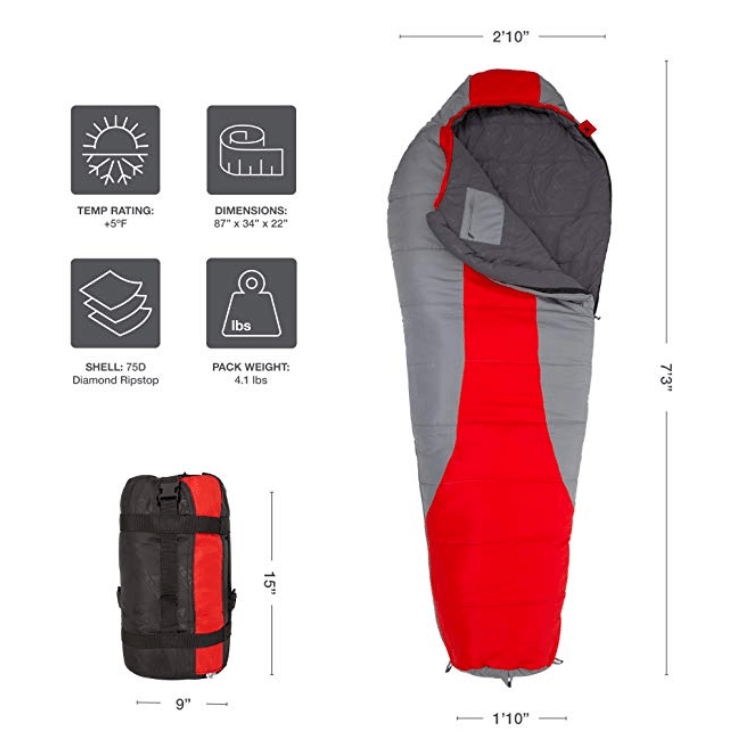 Ultimately, it is intended to be an ultra-portable, extremely lightweight, fair-weather sleeping bag that compresses into a carrying bag that measures 8 inches in height or less. The Outdoorsman Lab sleeping bag has a variety of features to offer. First, it has a water-repellent shell and a quick-dry, polyester liner, and it is rated for temperatures near 40-degrees Fahrenheit. It has anti-snag zippers and it is machine washable. In addition, it features an integrated pillowcase which will keep your pillow in place or allow you to use towels or clothing as a pillow. It also boasts a large, zippered interior pocket as well as elastic straps that fix the sleeping bag to a sleeping pad. 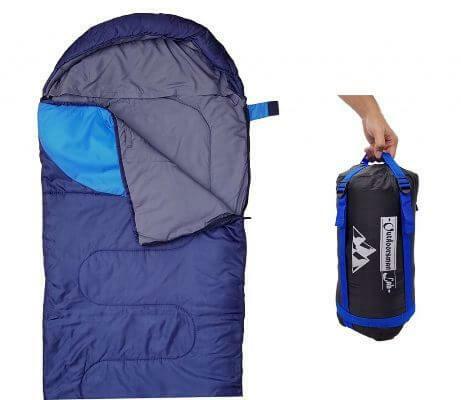 This sleeping bag is available in two sizes and two colors: regular and XL, and blue and dark blue. It can be used as a blanket when completely unzipped, or it can be attached to a second sleeping bag. Outdoorsman Lab offers a 90-day, risk-free trial of this product, a lifetime warranty, and discounts when you purchase 2 or more of their select outdoor products together. The Quandary sleeping bag is a high-quality, down-filled, three-season mummy bag. It is rated for 15-degree Fahrenheit temperatures and is available in five colors and three sizes: black, blue, light blue, maroon, and red, and sizes long, regular, and short. This sleeping bag is made with a water-repellent ripstop nylon liner and extra-large, anti-snag zippers. 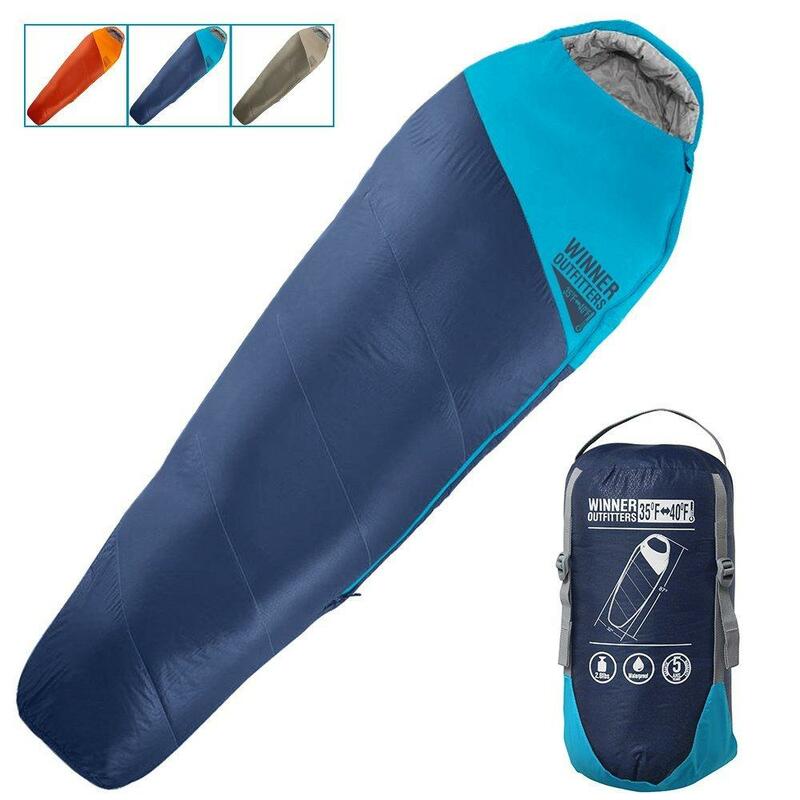 In addition, this sleeping bag is extremely lightweight, no matter the size you select. It comes with a water-resistant compression sack that measures 10” tall and 7.5” in diameter and weighs no more than 3.24lbs. 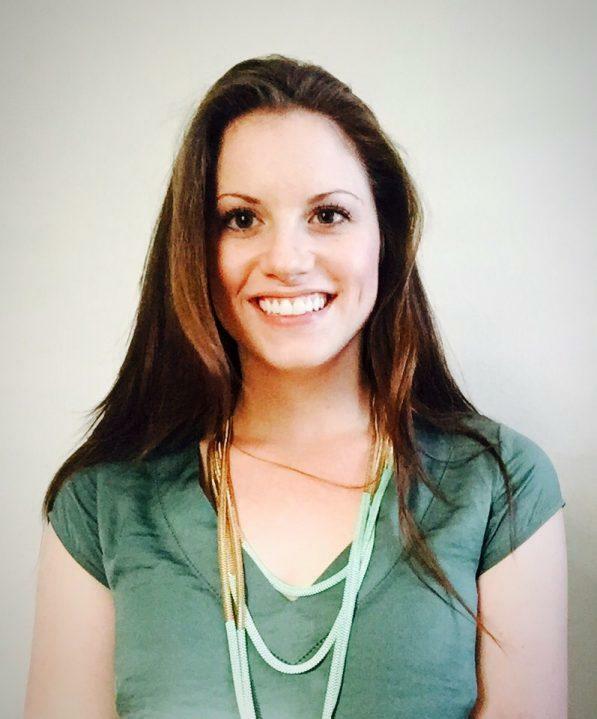 Hyke & Byke is a company that gives 10% of its sales to help eliminate poverty, and they also offer a lifetime warranty on this product. What Else Should You Consider When Purchasing Ultralight Sleeping Bags? There are several other factors to consider when purchasing your ideal ultralight sleeping bag. Oftentimes, the first factor that people consider is price. As mentioned earlier, sleeping bags with down insulation are typically more expensive, followed by those with synthetic insulation and those with extra options and features. Each of the recommended ultralight sleeping bags above range in price from $25 to $145, but some can cost as much as $800. Fortunately, most of the recommended sleeping bags offer a money-back guarantee if you are unsatisfied or a warranty to protect your purchase. As previously mentioned, ultralight sleeping bags are not built to be very comfortable, and this is understandable because with comfort comes bulk. Ultralight sleeping bags are made for convenience, so if possible, plan for an alternative way to add comfort. For example, you could purchase a lightweight sleeping pad that can be rolled up in your sleeping bag’s compression sack. Or, consider leaving the bulky pillow behind and plan on using cozy sweatshirts for head and neck support. Overall, ultralight sleeping bags are intended to serve the purpose of being extremely portable, not to provide a luxurious sleep experience. So, once you decide that an ultralight sleeping bag will work best for your needs, most of your work is done. The ultralight sleeping bags on the market offer many of the same features with only slight differences. However, those small variances can make a big difference when you are out in the wilderness with a sleeping bag that you are not satisfied with. Be sure to focus on your preferences and the extra options and features that fit your taste.